Straight blade for making clean edge between lawn and landscaping/ curb. The EdgeMaster is a commercial-grade edging machine that offers unmatched durability for large property managers, municipalities and anyone else who needs their edging machine to last year after year. 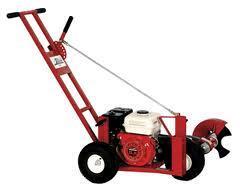 All steel construction, a 1 inch spindle and an adjustable curb wheel ensure lasting power and versatility. * Please call us with any questions you may hav about our edger lawn gas rentals in Wayzata MN and the Western suburbs of Minneapolis.